Earlier this year, on 28 January, the Islamic Republic of Mauritania acceded to the Biological Weapons Convention (the BWC – formally named the Convention on the Prohibition of the Development, Production and Stockpiling of Bacteriological [Biological] and Toxin Weapons and on their Destruction). The news was announced on 4 February by the United Kingdom, one of the three depositories of the BWC along with the United States and Russia. By acceding to the convention, Mauritania formally commits never to develop, produce, acquire, transfer, retain, stockpile or use biological weapons. While the state was not suspected of pursuing a clandestine biological weapons programme, its recent accession remains a meaningful development as it brings additional trust in the peaceful nature of its activities, and strengthens the global move towards non-proliferation. Mauritania joining the BWC is also an important step towards the convention being globally implemented, as it now has 172 states parties. Prior to Mauritania, the most recent state to accede had been Myanmar, on 1 December last year, and there are encouraging signs that Andorra and Angola may soon follow suit. These developments can be attributed to the efforts of the Chair of the BWC, the depository governments and states parties in advocating for the convention to be universalised. The Implementation Support Unit (ISU), based in Geneva, spearheads these efforts. The ISU faces significant structural constraints, however, with its body of staff limited to only three employees. This number is very low if one compares it, for instance, to the almost 500 individuals serving the Technical Secretariat of the Organisation for the Prohibition of Chemical Weapons (OPCW). Paradoxically, the understaffing of the ISU may have contributed to its success, as it was forced from the outset to find efficient working methods and develop strong partnerships to source human and financial resources. The European Union has provided close to EUR 5 million in support of the BWC through three decisions adopted so far by its Council, and it has also channelled additional resources through its initiative aimed at establishing chemical, biological, radiological and nuclear centres of excellence. Similarly, the United States has contributed through the Department of State’s Biosecurity Engagement Program and other channels, while other key partners such as Australia, Canada, Norway and individual European countries have also offered support in their national capacity. The African Union, World Health Organisation, the Food and Agriculture Organisation and the 1540 Committee Experts Group, among many others, have also worked with the ISU in a mutually reinforcing way to produce tangible results in terms of implementation and capacity building. The BWC is recognised as a central component of the global security architecture, embodying the renouncement of states parties in ever resorting to biological weapons. This makes it an important step towards a world free of weapons of mass destruction. The relevance of the BWC was made even more pertinent following United Nations Security Council resolution 1540. 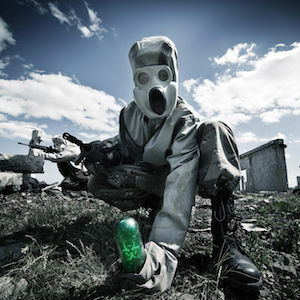 Adopted in April 2004, the resolution addresses the threat of proliferation of all kinds of weapons of mass destruction, which includes biological weapons. These two international instruments strengthen each other: the main goal of the BWC is to prevent proliferation activities conducted by states, while resolution 1540 aims at preventing proliferation activities by non-state actors, such as criminal groups and terrorists. Unfortunately, African states have far from reached their full potential in implementing the BWC. Eight African states are still not parties to the BWC, (Angola, Chad, Comoros, Djibouti, Eritrea, Guinea, Namibia, South Sudan), while six African states are signatories only (the Central African Republic, Côte d'Ivoire, Egypt, Liberia, Somalia and Tanzania). The decision to join an international convention is a prerogative of national sovereignty, and no state should be forced to do so against its will. However, that such a high number of states are not parties to the BWC sends a troubling message about Africa’s commitment to prevent the proliferation of biological weapons. It should also be noted that only a limited number of African states parties participate in the confidence-building mechanism developed in the framework of the BWC. The framework relies on states parties to provide information annually to instil trust in the peaceful nature of their activities conducted. Over the past 20 years, only 16 African states parties have participated at least once in the mechanism. The more recent figures are not encouraging: in 2014, only four African states parties submitted a declaration. A lot of work awaits Daniel Feakes, who was appointed as the new head of the ISU in November 2014, to strengthen support for the BWC on the African continent and facilitate capacity building. In light of the important challenges that remain, the ISU should consider launching an African programme, as has been successfully achieved by other international organisations such as the OPCW. This would be useful to address implementation challenges in Africa in a systematic manner, and to develop sustained co-operation with relevant partners.